What happens when you take a chance, even if it makes you nervous? Freia David’s mom and boss did just that, and the woman who has Down syndrome is retiring from her job after 32 years. Story originally published in the Boston Globe. When Freia David began working at McDonald’s through an innovative program to place adults with cognitive disabilities in community jobs, her mother worried. What if the work was too hard? What if she didn’t fit in? 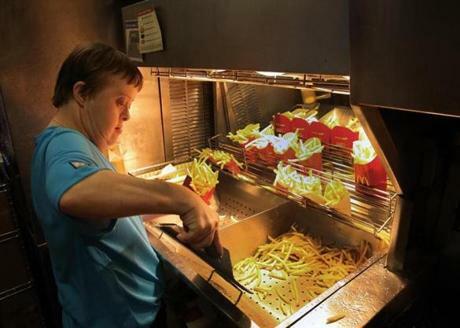 While two of her peers did not finish the six-month training, the young woman with Down syndrome quickly warmed to the fast-food work, wiping down counters, filling ketchup dispensers, and greeting customers with a smile. Then she got a chance at the french fry station, and Freia David — whose given name sounds like “fryer” spoken with a strong Boston accent — responded as if she were born to it. For the next 32 years, five days a week, she has spent the lunch rush frying, salting, and boxing fries at the Needham McDonald’s, always arriving an hour early, sometimes dancing in place before the stainless steel Frymaster. On Saturdays, she returns with her mother to eat lunch and see friends, day-off visits filled with hugs and high-fives. David, 52, was closing in on 1 million pounds of fries served when her mother, Anneliese, an elegant and energetic 90, noticed that her daughter was showing signs of forgetfulness. Early onset dementia is common among people with Down syndrome, and Anneliese David worried for her safety around fryer oil and heat lamps. She urged her daughter to retire. Am I being fired? David asked her mother. No, she reassured her. But it was time to go. The job had meant everything to David, her mother said. It had been “her life.” But when David announced she was leaving, how much she meant to the restaurant instantly became clear. Management hung a banner celebrating her 32 years and invited the community to a retirement party. The Davids expected a few old friends to show up Monday. Instead, more than 100 people packed the McDonald’s — loyal customers, former neighbors, adults with disabilities and their relatives, and many others — all there to wish David well. They sent her off in style — two cakes, a silver necklace adorned with a fry-carton pendant, a cut-crystal model of the restaurant, a collection of photo collages, and a stack of heart-felt cards, along with a set of her favorite Disney stuffed animals and a proclamation from the state House of Representatives. For three hours, they enjoyed complimentary fries and bites of cake in between selfies. Anneliese, who was born in Germany and settled in Needham with her husband, Lothar, worked at this McDonald’s herself in the early 1960s, between the time her first child, Sabine, started kindergarten and Freia’s birth two years later. At Christmas 1963, Anneliese had cried and prayed over her infant daughter’s diagnosis, worried she “never would have a regular life” in an era when many adults with developmental disabilities wound up in institutions. But as the years passed, she watched her daughter become an energetic girl who loved pop music and Disney movies, especially live-action ones such as “The Parent Trap” and “Pollyanna.” And she watched times change with her, bending toward inclusion. In her early 20s, David was working in a sheltered workshop for adults with disabilities run by the Charles River Center, when the Needham nonprofit persuaded McDonald’s and another company to hire a few workers on a trial basis. A counselor recommended David and urged her mother to let her try. In the decades since, Charles River has placed hundreds of adults with disabilities in jobs across the region, and all the while David has worked the fryer in Needham. She never needed to be roused from bed, wanting to get to work early to relax and chat with customers before starting her three-hour shift. Each shift began with a hug for the manager, Rony Sandoval, and ended with the same question — had she done a good or bad job? Sandoval’s answer was always the same, a silent high five and wide smile. On Monday, he and other coworkers presented David, who sat with her friends from the Charles River group home where she has lived during the week since her late 30s, with gifts and toasts. As a parting gift, he promised David and her mother free meals for the rest of their lives. Then, as cameras clicked, David took one last turn at the fry station. Sandoval called out orders — “Can I have a small fries, please? . . . Medium fries, please?” — and David maneuvered the fryer basket, salt shaker, and fry-to-carton sifter with a well-honed rhythm. When she looked to Sandoval, he smiled and gave her a high five. As the party ended, he sought her out again for a hug.